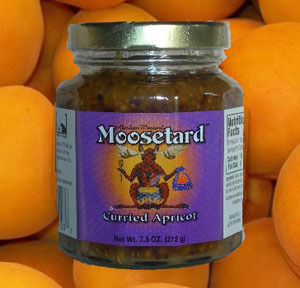 Curried Apricot is a sweet mustard made with mild sweet curry, apricot preserves and dried organic apricots (to avoid sulfites). The idea for this product came from our travels in Southern Africa and the popular use of a curried apricot sauce used as a sosatie dip and as a glaze during Braais (barbeques). When tested at the Fairbanks Farmer's Market customers demanded we add it to our product line. This mustard goes well with any meat and makes a superb glaze for chicken and pork. *This is our only "naughty" mustard since it contains corn syrup as we are unable to obtain bulk apricot preserves without it.